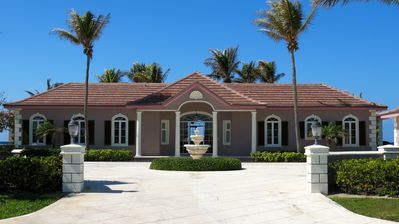 Island tranquility at its best – a luxury oceanfront private villa just 56 miles from Florida. 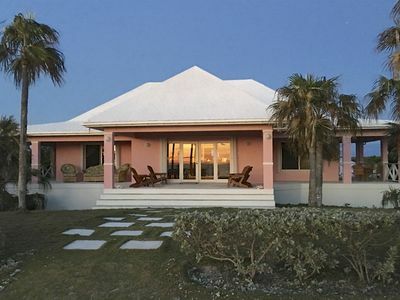 Waterside Escapes Villa IS located on Grand Bahama Island and situated on the westernmost tip of the island with expansive views over the Atlantic Ocean. 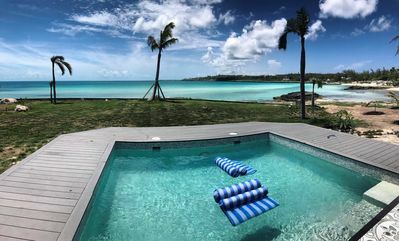 This Bahamas villa includes a main house with living room, dining room, kitchen and master bedroom, two oceanfront guest suites are detached from the main house to offer complete privacy, an infinity pool with beautiful ocean views, and a private boat dock. 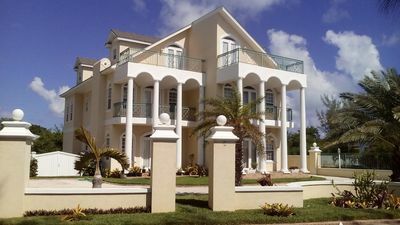 The Waterside Escapes design is truly masterful, with its dramatic courtyard entrance, coconut-palm pool deck, elegant wide verandas, gorgeous mahogany doors, stunning tray ceiling, and so much more. This tropical home sleeps up to 8. 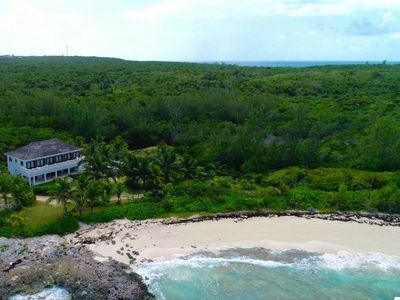 The main house and cottages are fully furnished and professionally decorated properties with 3 bedrooms, expansive views of the ocean and breathtaking sunsets and each include a private full bath, flat screen TV, cable, wireless Internet access, and air conditioning. The Living Room has elegant and spacious seating along with Beautiful wood trey ceiling with tropical fan. The Dining Room contains a beautiful mahogany table that seats 12. 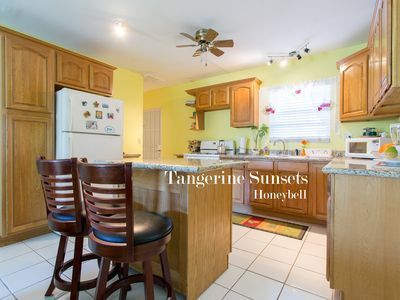 The Family Room provides a quiet sitting area with ocean view, with a large flat screen cable TV. The Master Bedroom comes with king size bed, flat screen TV and a private bathroom with tub and shower and luxury bath amenities. The guest cottages each have king beds, private bathrooms, flat screen TVs and double doors which open right on the ocean’s edge. Waterside Escapes is the ideal destination for a secluded wedding, family reunion or corporate retreat. 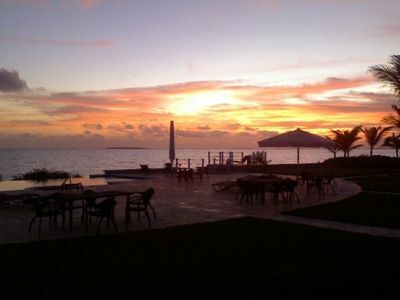 Imagine a simple wedding ceremony by the pool, overlooking the ocean at sunset. Our property can host a wedding reception of up to 25 guests. Waterside Escapes has a private boat dock for the exclusive use of villa guests. The dock is on a private canal and can accommodate boats up to 120’ with a 13’ draft. Customs & Immigration and fuel is available from the Old Bahama Bay Marina. 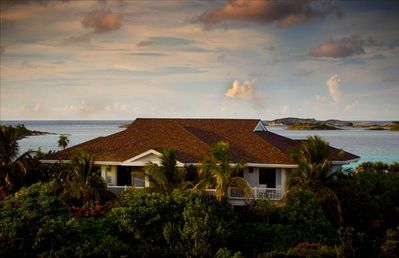 The property faces the ocean to the west, which affords it magnificent sunset views. 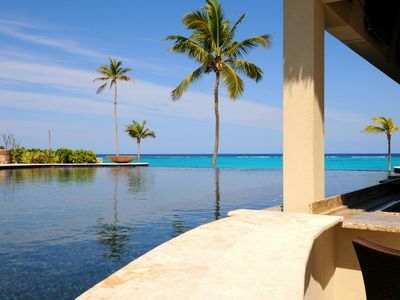 The centerpiece of the property, the infinity-edge pool, appears to flow into the ocean water below. 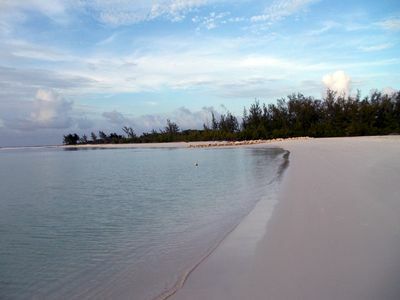 Old Bahama Bay Resort is just 2 minutes by car with water and land activities, restaurants, beach and a private airport. Restaurants and shopping in Freeport and Lucaya are located just 35 minutes by car. 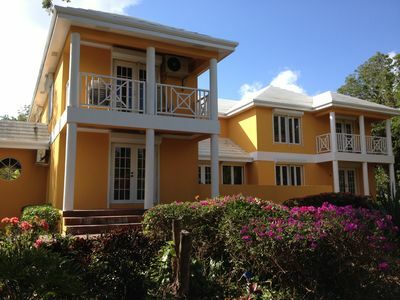 While enjoying the privacy of your own villa, everything you could desire for your trip is at your fingertips. 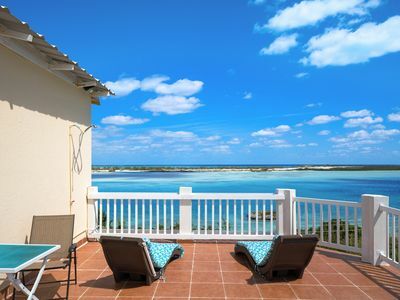 Guests of Waterside Escapes have use of the owners’ bicycles plus use of the amenities at Old Bahama Bay including beach access, fitness center, spa services, tennis court, beach playground, and so much more. 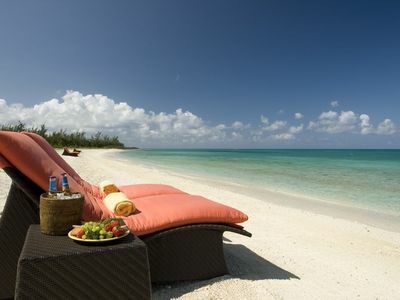 Guests can arrive by commercial flight into Freeport or by private plane or charter into West End. 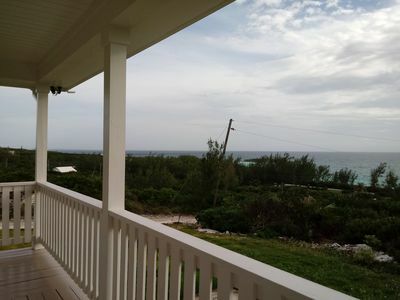 Guests can also travel by ferry into the Grand Bahama Island Port or by private vessel, clearing customs right here at Old Bahama Bay Marina in West End.